Over 5 billion mobile phones globally are being replaced by 5 billion smartphones and tablets. Is your business evolving? By the end of the year over 50% of all online surveys will be opened on these new devices. How can your company connect with this audience to get the feedback you need to to run your business? 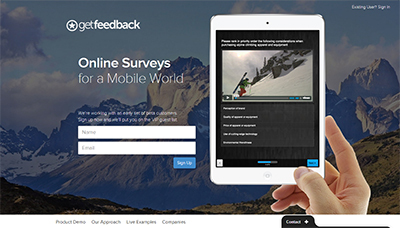 GetFeedback is a modern survey marketing application designed and built for today’s world. Easily create an online survey experience with perfect branding, beautiful imagery, even embedded video. More importantly, with every survey you create, GetFeedback will dynamically size and display your content perfectly for every smartphone, every tablet, and every browser. The result? An amazing online survey experience for your audience that results in better response rates, better feedback, and better decisions for your business. Who said online surveys can’t be fun? Today there are 1.5 Billion smartphones, and in a short number of years we will see 5B smartphones globally (source: http://bit.ly/1a7Ev4L). Already, around 50% of all surveys are opened on a smartphone or tablet, that’s +330% growth in the last 2 years alone. (source: http://bit.ly/1a7Ettu). How will your company evolve in this rapidly changing world, and how will you and your colleagues continue to make great business decisions? GetFeedback is a modern survey marketing application designed and built for today’s world, allowing anyone to easily create an online survey experience with perfect branding, beautiful imagery, even embedded video. More importantly, GetFeedback will dynamically re-size and re-format any survey to display perfectly on every smartphone, every tablet, and every browser. The result? Your business can deliver an amazing, fun, engaging experience for your audience that results in better response rates, better feedback, and better business decisions.